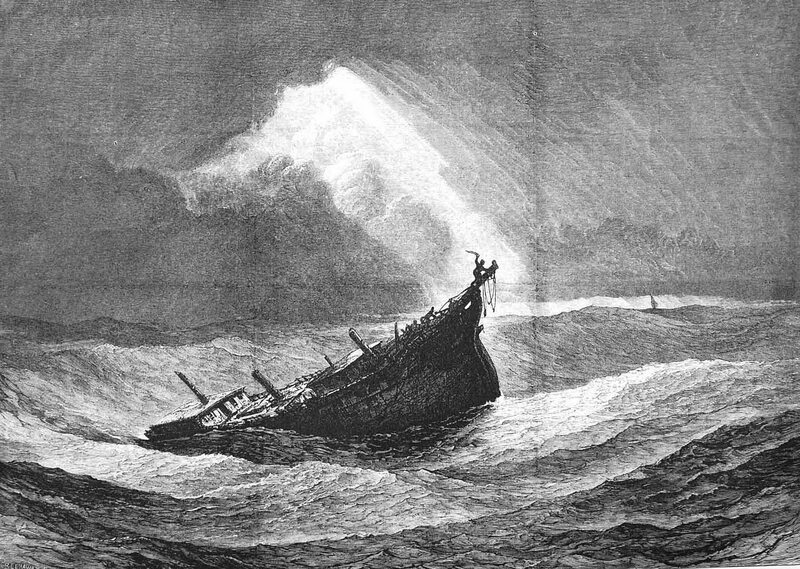 A shipwreck depicted in an 1875 issue of the Illustrated London News. The grounded and dis-masted "General Arnold" must have looked quite similar. On Christmas Eve, 1778, the brigantine General Arnold departed Boston bound for the West Indies, in search of British prizes. The vessel, mounting 20 guns with a crew of 105, was commanded by Captain James Magee. She was a privateer, not to be confused with Continental naval vessels (which at the time numbered scarcely more than 30 small warships). Privateers such as the General Arnold were privately owned, had been outfitted by their owners as warships and were issued letters-of-marque by the Province of Massachusetts, entitling them to take prizes. That piece of paper was the all-important fine line between a privateer and a pirate. Soon after the General Arnold left Boston harbor, a monstrous blizzard began. Captain Magee prudently made for Plymouth harbor, seeking refuge from the storm. By the next day, Christmas Day, the privateer had labored its way to Gurnet Point outside of Plymouth Bay and anchored at the entrance to the bay. Magee signaled in vain for a pilot. No pilot boat would venture out in this storm and without a local mariner to safely pilot the brigantine into the harbor, Magee would have to risk navigating unfamiliar shoals and sandbars. There was no choice but to ride out the storm in the open water of Cape Cod Bay and to hope a pilot might reach them the next morning. Unfortunately, the storm only grew worse during the night. Straining against the wind, the General Arnold began to drag her anchor and, around dawn on Saturday, December 26, she went aground on White Flats in Plymouth Bay. Now partly submerged in icy waters, pounded by furious surf and gradually being forced deeper into the sand, the General Arnold was still more than a mile off of Plymouth’s shore. Captain Magee ordered the masts cut away in hopes of floating her off the sandbar, but it did not help. To make matters worse, several of the men used their axes not to cut away masts, but to break into the liquor stores. Magee and the other officers eventually managed to get the crew under control and ordered them below decks to wait out the storm. With any luck, the storm might break and help would arrive from the town of Plymouth. But the brigantine could not withstand the punishing waves. Shortly after she went aground, her seams began to split. The ship filled with frigid water and the crew was forced back up onto the deck, exposed to the wind and snow. Using sails, they managed to rig some meager shelter overhead, but it probably provided very little comfort. During that awful day, the storm only grew worse. When the tide came in, waves washed over the main deck, soaking the freezing crew. As the day wore on, Captain Magee issued the remainder of the rum, telling the men to put it in their boots as this would prevent their feet from freezing. There were claims that this trick saved many lives, though I wonder if it really made any difference. The first man to succumb was, ironically, one of the largest and strongest. Captain John Russell, in command of the detachment of Marines, suddenly dropped, even as he was yelling out encouraging words to the crew. The General Arnold had but one boat, a yawl, which might have been used to ferry the men off the ship. The surf would probably break the small boat to pieces and drown any who tried to escape. But some wanted to give it a go. At some point on Saturday afternoon three men took the yawl (and sources conflict as to whether they did this with Captain Magee’s permission or whether they stole the boat) and successfully rowed it to a frozen section of the bay. They walked across the ice to a schooner that was frozen in and there waited out the storm, never returning the yawl, which might otherwise have been used to save many of the crew. For those suffering on the deck of the General Arnold, a long, freezing night lay ahead. The only consolation was that, around sunset on Saturday, the tide went out and the men were no longer battered by waves. This brought them some encouragement that they might be able to hold out a while longer. But in the night, the wind shifted to the northwest and it grew bitterly frigid. And, of course, eventually the tide came back in. By the next morning 30 men were dead. By Sunday, December 27, the residents of Plymouth were aware of the wreck on White Flats out in the bay. As the remaining crew fought to stay alive, Plymouth folk struggled to get boats out into the bay amidst the wind and snow. But all was rapidly freezing, the bay was a churning mass of waves and ice floes, and boats could not make it out to White Flats. Time and time again, the townsfolk tried and repeatedly, they were forced to turn around. Watching this, the crew of the General Arnold truly began to despair. 70 men perished on board the General Arnold. 33 were brought ashore alive, of whom nine later died. The survivors included a young Barnabus Downs who was so paralyzed by frostbite and hypothermia that he could only blink his eyes to alert the rescuers that he was alive. The victims were buried in an unmarked mass grave on Burial Hill in Plymouth. Captain Magee survived and led a successful career as a merchant captain. He died in 1801 and, in accordance with his wishes, was buried with his crew in the mass grave in Plymouth. 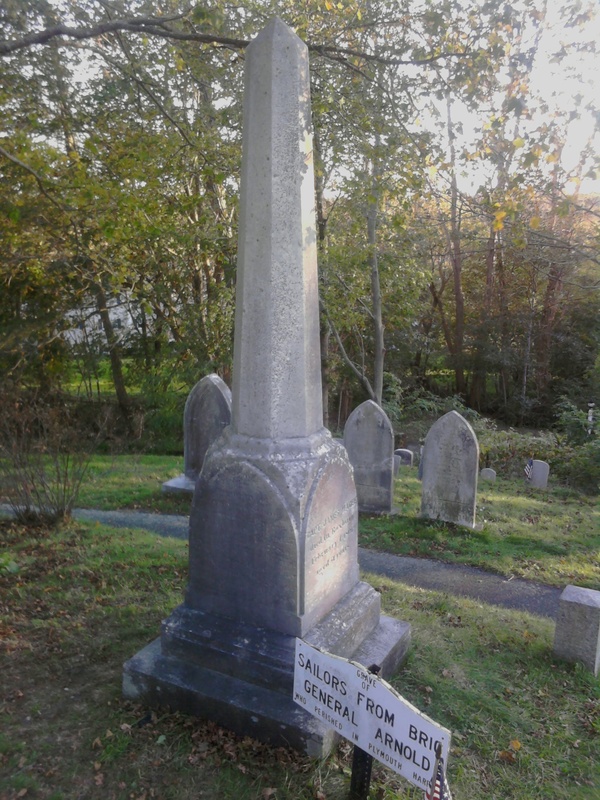 In 1862, Stephen Gale of Portland, Maine heard of the story and although a complete stranger to any of the crew or their families, was so moved that he paid for a marble obelisk which was placed on the grave site. The oft repeated story, so tramautic to Plymoutheans who witnessed the aftermath, is now blurred around the edges and frequently blended with legend. One aspect of the tale that I have often heard repeated is the notion that General Benedict Arnold, after whom the vessel was named, made his decision to defect to the British on Christmas Eve 1778, and thus the supposedly simultaneous shipwreck of the General Arnold takes on a fateful and eerie aspect. Rubbish, of course. We don’t know precisely when he made up his mind, or even if there was a single moment at all. It is true, however, that by December of 1778, as military commander of Philadelphia, Arnold was growing increasingly disillusioned with American politics and the Revolution. Looking at the myth the other way around, I wonder if he ever heard of the wreck of the privateer named after him and if he took it as an omen.